Could anyone explain to me how the Exp calculation works in this game? 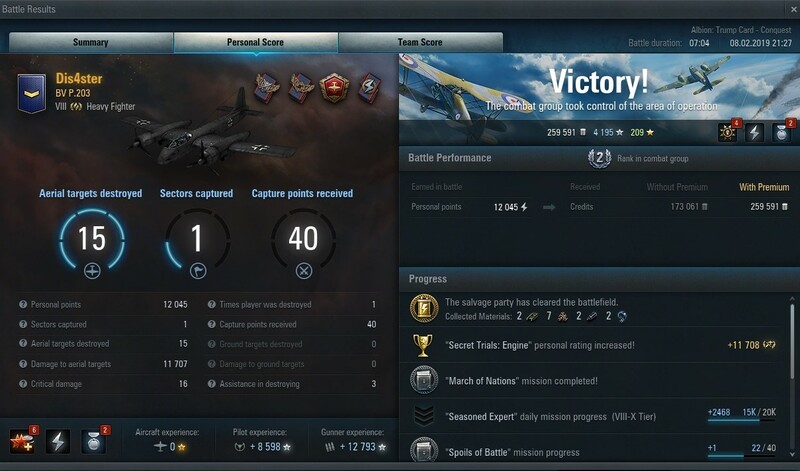 BV P203, 15 kills, in tier 9 battle with 4 kills of Tier 9 enemies. 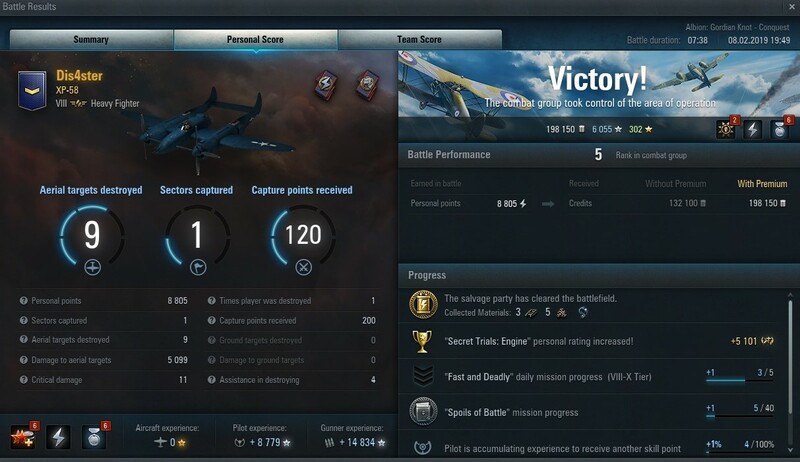 And then XP-58, again Tier9 battle with 1 Tier9 kill, less damage, less kills but more base exp. Both were of course without daily double, the only differences here are the nation and the specialist config, which the BV doesn't have yet. Just got this, half Tier7 half Tier8 battle and almost all of the 12 kills were on Tier7 human pilots. Is that how you earn exp, focus the bottom tier humans? Edited by Dis4ster, 08 February 2019 - 09:28 PM. Just a suspicion from my side: Heavies receive more income from capture points than from killing. That would at least explain your screenshots. Isn't there currently a mission that gives 1,5x XP ? 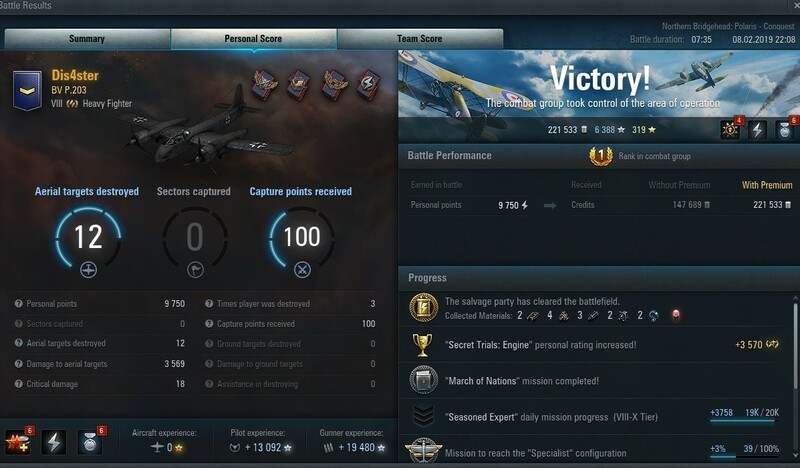 Yes, 1.5x pilot xp. Ends today. The BVP is a premium plane, so it has a bonus on cew XP. Try the same comparison with acelerated crew training turned off and compare only the xp that go on the plane. I don't get what you mean, but let me explain the screenshots. All the battles had the same Boni on exp, the accelerated crew training or a mission that gives you extra crew exp doesn't matter here because we are talking about the aircraft exp(upper right side next to the credits) that makes no sense. Edited by Dis4ster, 13 February 2019 - 10:40 PM. While we're at calculations, I am puzzled as hell with this one tonight. My best game ever in material and there was no logic to be so. I've studied the sheet Blindfold provided, previously did everything by the book - kill Special Objects etc - and in my very good performances got 3-4 Flight Instruments that I'm always short with. Now this was a relaxed game, I haven't put any effort into strategy. At the start flew to the Airbase in the middle (without the bomb load, haven't touched the ground targets), stayed there in the blue all game and did a decent amount of kills. Nothing to write home about, but decent. And in the final score I got 7 of the damned things. Why?!?! ?I had games where I killed 3-4 radars, control towers, all the Special stuff, contributed in multiple bases, and 2-3-4. Now here in noobish enjoying in the blue exclusively with the planes, 7 and crapload of other stuff. Edited by zen_monk_, 14 February 2019 - 12:06 AM. Who says there is any relation between what WG puts on paper and what the game does ?? Just look at the matchmaker story ... in software development (coding) everything is supposed to work as defined in the functional design, but that's hardly ever 100% true. Ahhhh the Million Dollar question, I think we would all like to know the answer to this little gem of a question, without any Bull*&$t.